Personal firearms (and training in their use), and braces. Both give kids a cause for smiling. Remington 870 Youth 20ga in pink camo. Around here, it actually fits pretty well with faded yellowish grass. 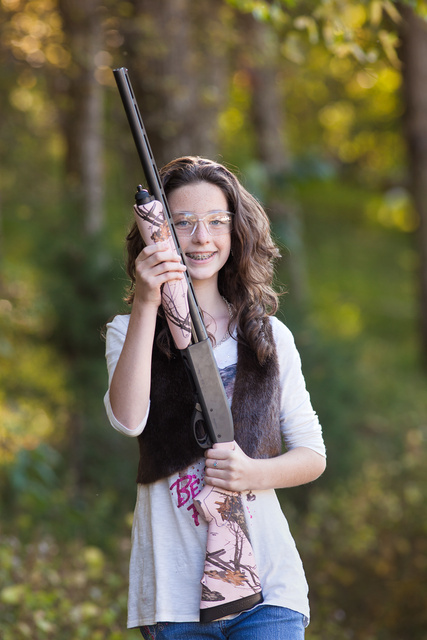 This entry was posted in interesting people, shotgun and tagged 20ga, girl, pump shotgun. Bookmark the permalink. Remington makes a fine pump gun, a great start for a youngster. I have to pass on the pink stock though. If my granddaughter wanted one would Bank of Grampa finance it? You betcha! Neither my wife nor daughter can stand this fad of pink guns. My wife asked me to dress up her M&P 15-22 in magpul OD green and my daughter (age 14) wanted her AR in FDE. Just to be different, my son (age 11) wanted foliage furniture on his!!! If anyone wanted to know where all the .22 ammo went, ask this crew– they sure do burn it up!!! I have a Remington 870 20-ga with the 21″ barrel and an adult sized stock. The 20 is a fine home defense shotgun with #2 or #3 buckshot and can be used by both youngster and some senior citizens who find the 12 gauge too heavy or too punishing. If it takes living with a pink stock to get the woman in your life to shoot, then do it. A friend found an unexpected side benefit when his 20-ish daughter pointed her hot-pink stocked shotgun at a would-be intruder at the back door. He told one of the arresting cops that when he saw the pink-trimmed shotgun he knew it was HER shotgun and she probably knew how to use it.